All of these movies are in .mp4 format. The more recent ones are encoded using the H.264 codec. Most of the latest browsers will play these movies. Firefox Users need version 36 or later to play all of these movies. Unlike all other browsers, the Mac version of Firefox seems to require that the entire movie be downloaded before it starts playing. If you are having a problem playing a movie, please check that you have the latest version and the latest update for your browser or try another browser. If you can't get a movie to play, please submit a Support Ticket through our Support Center with details of which movie you are trying to watch and which operating system, browser and browser version you are using. Find out how to install your downloaded ProSelect software on your Windows computer and start your trial. Click the green Play button to watch the movie now. If you are installing on Mac click here. This movie will give you quick overview of the basic features in ProSelect. Click the green Play button to watch the movie now. 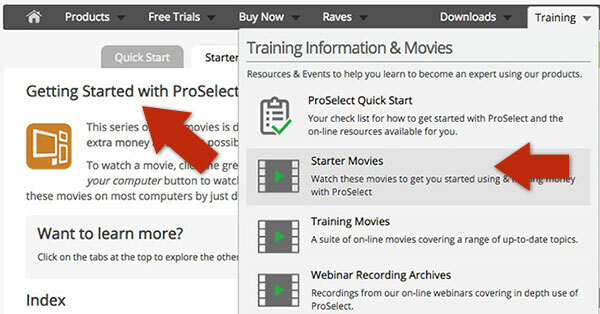 Watch a few movies in our Getting to Know ProSelect Movies series. Put each movie into practice using our supplied Sample Album of images (see below) or your own images at your next sales session then watch the next one. Each one will teach you more of the basics. You will find all our Training movies under the Training Menu. Re-inforce what you have learnt in the movies by skimming through the Quick Start Guide. This pdf file is automatically installed when you install ProSelect. You can open it from the Help Menu in ProSelect. You will need Adobe Acrobat Reader installed on your computer to read the Guide. If you don't have it click here to download a free copy. If you prefer a printed copy, you can download and print a print-res copy from the Downloads page. 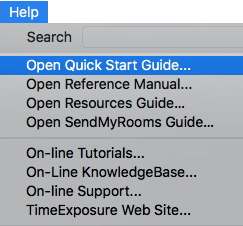 The ProSelect Reference Manual is also accessible from the Help menu in ProSelect and the Downloads page. To open this album file, select Open Album (from the File Menu) and select the file "Sample Album.psa" in the folder mentioned above or just double-click on the album file. When you have finished, select New Album (under the File Menu) to clear this Album out of ProSelect. Drag a folder of high-res images (.jpg, .tif or .psd) into the lefthand column in ProSelect (called the Image List) to load them. Click the Add Folder button (bottom left corner) and select your folder of images to load. After the images have been loaded, you should save them as a ProSelect Album file using the Save Album command (under the File Menu). Have a play with your own images using what you have learned in the Getting to Know ProSelect movie series. To get you quickly started, ProSelect has a heap of included resources already installed. However, you can find and download even more from the ProSelect Resources pages (in the Downloads Area). More movies can be found on our Training Movies page. You can event search for a movie by keywords. For personalized attention, submit a support ticket through our Support Center.